Is Jesus's moral philosophy broad in scope, such that it includes a political morality, or narrower, consisting only of private virtues? This is the question we began debating in the previous installment. There, we considered two reasons why people may advocate the "narrow" view: clinging to an image of Jesus as presented in right-wing ideology, and the false dichotomy that Jesus's teaching was spiritual rather than political. A third and final reason used to defend the narrower-scope perspective is the claim that (although Jesus was obviously addressing gatherings of people) the context of his teachings is limited to the moral behavior of individuals and their relationships with others, thereby excluding the behavior of organizations such as governments. It is true enough that Jesus seldom explicitly speaks about groups of people when he is making moral statements. But these moral values do make sense when applied to socioeconomic issues, and crucially, as I will elaborate in what follows, there is reason for regarding their being intended to do so as the default position. In contrast to the individualist claims, the eminent theologian Stanley Hauerwas clarifies that Jesus’s moral teaching is “not addressed to individuals but to the community that Jesus begins.” He continues: “You cannot live by the demands of the Sermon on your own, but that is the point. The demands of the Sermon are designed to make us depend on God and one another” (Hauerwas, 2006, Matthew, SCM Press; quoted in Hill, p. 162). In other words, it is an ethic that can only be realized in a context of social interdependence. Amy-Jill Levine sees this as a “very Jewish… communal vision of what could be and what should be” (Levine, 19 & 51). And Judaism is the key to this whole controversy because we can find the illumination we need in understanding Jesus as a Hebrew prophet in continuity with the prophets of the Hebrew Scriptures. The morality of the Hebrew Bible, its structure and its virtues, are to a great extent collective and systemic rather than individual and personal (Borg, 146–7). It's a reasonable hermeneutic principle to assume that this is the case of Jesus’s morality also, given that this is the context from which he is teaching, and he does not warn to the contrary. This means that the burden of proof is on the defender of the narrower-scope perspective to show that the alternative is inaccurate, and as the possible reasons for this have been defeated in the foregoing, it follows that the broader scope perspective is correct. I will continue to provide evidence in favor of this conclusion for the remainder of this section. What is the sin that the Hebrew Bible most frequently and forcefully condemns? It is idolatry, the worship of things other than God, the idolization of that which falls short of divine perfection. But which sin comes second? Not sexual sins—although they are serious because they strike at the heart of our relationships and can create life, they are way down on the list. The answer is the oppression of the poor by the rich, the failure to enact social and especially distributive justice. Indeed, so evil were these social consequences of greed, that the Hebrews regarded it as a form of idolatry, as did St. Paul (Col. 3:5). And when we just take the prophets rather than the Hebrew Bible as a whole, the exploitation of, and failure to share food with, the poor leaps up into first place on our most wanted list (see Amos and Jeremiah especially). A particularly striking example of how the Hebrews addressed the issue, as described by Marcus J. Borg, was in laws “intended to prevent the emergence of a permanently impoverished underclass” (Lev. 25). Essentially, “every seventh year, the Sabbath Year, all debts are to be forgiven and slaves are to be set free. Every fiftieth year, the Jubilee Year, all agricultural land is to be returned to the family of its original owners, without payment” (Borg, 138). This illustrates the collectivist nature of the Hebrew understanding of morality that was the context for Jesus’s moral teaching. It is obviously not something that could work today, and in a moral sense it never truly did work because it was part of a socioeconomic system built on the destruction of neighboring civilizations—genocide—and military conquest. The Hebrews were of course conquered in turn by the Romans, and by the time of Jesus their occupation “had led to land being concentrated in fewer and fewer hands.” It is in this context that Jesus criticizes the rich, and refers to the "rich" collectively in the infamous "Eye of a Needle" passage (Luke 18:24–25) (Hill, p. 66). Ultimately, Jesus said he was proclaiming “good news to the poor” (Luke 4:18), and as Hill pinpoints, “News with no economic dimension would not merit this description.” Nor is it simply that it is good news to rich and poor alike, because in contrast to congratulating the poor, Jesus also says “woe to you who are rich” (Luke 6:24) (Hill, "Trusting in What Is Not Real," para. 7). And what all this context assures us of, is that while there may not be more things dreamt of in Jesus’s philosophy than there are in heaven and earth, one thing there certainly is, is an imperative for social justice, particularly toward the most vulnerable. 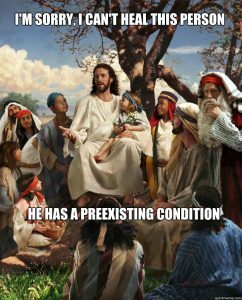 If the foregoing managed to bring a member of the religious right to concede that Jesus’s teaching requires striving for socioeconomic justice within the public square, I imagine their next move would be to claim that Jesus was a "compassionate conservative" who would not even dream of supporting interference in free markets. They would probably say that Jesus merely opposed corruption and would not have challenged the economic system itself. But the problem with this presumption is that it is not true. It is true that the repentant Zacchaeus says he will pay back fourfold any money that he has gained through corruption, but that is only after agreeing to give half what he owns to the poor (Luke 19:8). Moreover, there is no suggestion that what King and servants do in the parable of the Ten Pounds (Luke 19:11-27) is illegal or constitutes corruption. Likewise, there is no indication that the man in the Rich Fool, nor the one in the parable with Lazarus, gained their wealth through immoral means. Therefore the target of Jesus's critique was more fundamental than corruption. If we turn back to our last parable, after asking for Lazarus’s help to soothe his torment, it continues with the rich man being told that: “between you and us a great chasm has been fixed, so that those who might want to pass from here to you cannot do so, and no one can cross from there to us” (v. 26). 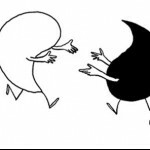 This "great chasm" that separates them in the afterlife creates an ironic reversal of their immediate proximity in life. While it would have been very easy for the rich man to help Lazarus, it is now impossible for Lazarus to help the rich man (O'Collins, 127). Note that the parable leaves open the question of why Lazarus dies; it does not attribute direct responsibility to the rich man. Hence if our imagined right-wing interlocutor were to argue that the reason the rich man is punished is because of what he personally did to Lazarus, that would not work either, because his “sin is one of omission,” (O'Collins, p. 126) the failure—along with our other rich men—to enact this justice. This is the greatest of sins to Jesus, who equates it with a refusal to share food and clothing with God himself (Matt. 25:42–46). What he is challenging in these parables therefore, is not the corruption or the selfish acts of a few individuals, but a system in which the wealthy fail to provide for the needs of the poor. time and experience are not to be divided between life and afterlife… but between the world as it is and the world as it must soon be. And far from teaching people to sit on their hands while they wait for a postmortem reward, Jesus invites us to live out the reality of the kingdom. Second, we cannot complain that those in need are too remote from us to help, because however far removed they are now, this is nothing compared to the infinite distance of death. In other words, someone’s location, all other things being equal, has no logical bearing on our responsibility to help them. This is a point Peter Singer famously makes in connection to giving to development charities, an issue that's also very relevant here (Singer, 232). Indeed, Jesus makes a similar point when he is asked who our neighbors are—i.e., who we have a moral responsibility to look after—answering through parable that it's not just everyone who lives near us, but anyone at all, a traveler miles down the road, someone we will never even meet (Luke 10:29-37) (O'Collins, 115). How then should we categorize Jesus’s political philosophy in contemporary terms? Is he a social democrat, a socialist, a communist? There is a sense in which he is a communist because, as we saw in part 11, he encouraged his closest followers to live as ascetics, giving away everything they had to their community. Hence, such a voluntary communism was for Jesus an ideal form of society, but his teachings do not morally require it of everyone, and hence it is not a political goal. I fear that a too-zealous attempt to draw immediate application from the Parables for private ethics or for political morality must necessarily miss the target … such an indiscreet zeal quickly transposes the parables into trivial advice, into moral platitudes. And we kill them more surely by trivial moralizing than by transcendent theologizing (Ricoeur, 243). The last thing that parables are, is specific. And that is fine, because the purpose of Jesus’s call to justice, like that of any great philosopher, is not to command us, but to stand against the way things are, inspiring us to question and to challenge them for ourselves. We will continue to look at Jesus's political philosophy in the next installment, in a discussion of further passages relating to fairness, generosity, and workers' rights. The parables of Jesus are about the Church-as-community, not about the state. Since Israel is fulfilled in the Church, the law of Jubilee is also fulfilled in the Church. 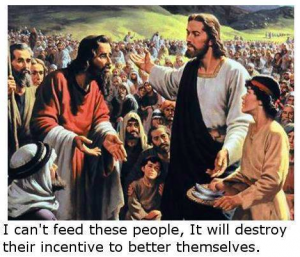 Even a “conservative” (by which you seem to mean: an economic libertarian) could agree with this and permit the Church to redistribute wealth as it pleased, so long as the state does not interfere. Thanks for your comment Chris! I did wonder what you’d make of it as we have disagreed on this in the past. I addressed the distinction you mention in some of the previous posts in this series. Essentially, my interpretation is that some of Jesus’ statements in this area apply only to people within what would become the Church, while others apply universally. I think your statement that the parables “are about the Church-as-community, not about the state”, is an over generalisation, as well as being problematic because the modern church and state were unknown in the context of the gospels. Ultimately, the case I have set out in this and the previous post for Jesus’ morality demanding social justice in a political sense still stands.